National Trust properties within the Lake District National Park have recently adopted a new "visual identity" aiming to give a fresh and striking interpretation of what the National Trust, "THE LAKES" represent. Below are several examples of the new "visual identity" on three of the Central and East Lakes vehicles with the following stories to relate. The image on this Ford Ranger represents the National Trust as supporters of outdoor activities with access to lakes such as Windermere and Ullswater. A group of kayakers setting off from National Trust land...Jenkyns Field...Windermere. The image on the other side of the Ranger represents the many miles of footpaths, bridle ways, and cycle routes that are freely available to be enjoyed by all. The National Trust Fell Rangers Blog gives an indication as to the amount of hard work that is needed to construct and maintain the footpaths in this region. An illustration of the Footprint building. This is the first straw bale building in Cumbria; it is set in the grounds of St. Catherine's with spectacular views of Windermere. It is a unique and popular venue...from school groups to green wood working events, and from birthday parties to yoga sessions. The Footprint alongside Wynlass Beck. An atmospheric view from the Footprint during a temperature inversion over Windermere. 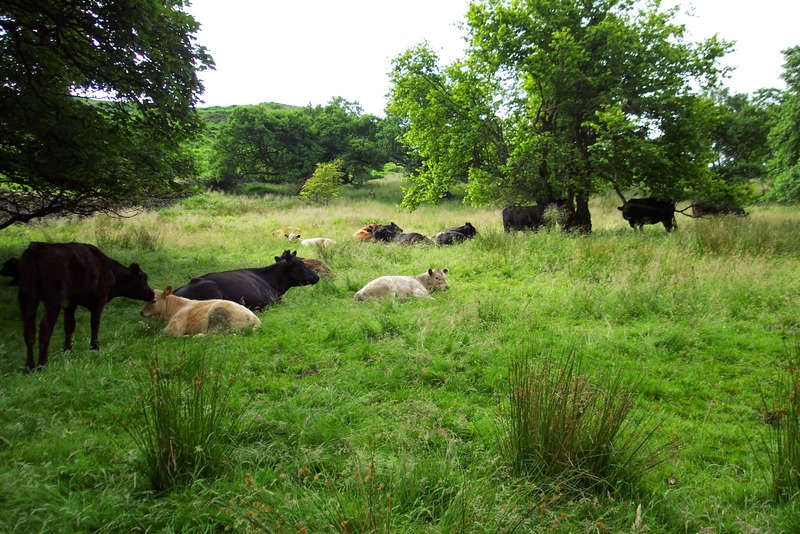 This image of a Belted Galloway cow, "Beltie", represents the strides that the National Trust are making in promoting and conserving ancient wood pastures. (various posts on this subject are on this Blog). This image is particularly appropriate as red squirrels have recently been seen at Hodgehowe Wood very near St. Catherine's, (where this vehicle is based). By keeping the numbers of grey squirrels in check, the reds are making a come back in this area. In partnership with the Penrith and District Red Squirrel Group,the National Trust have created a red squirrel trail at Aira Force. 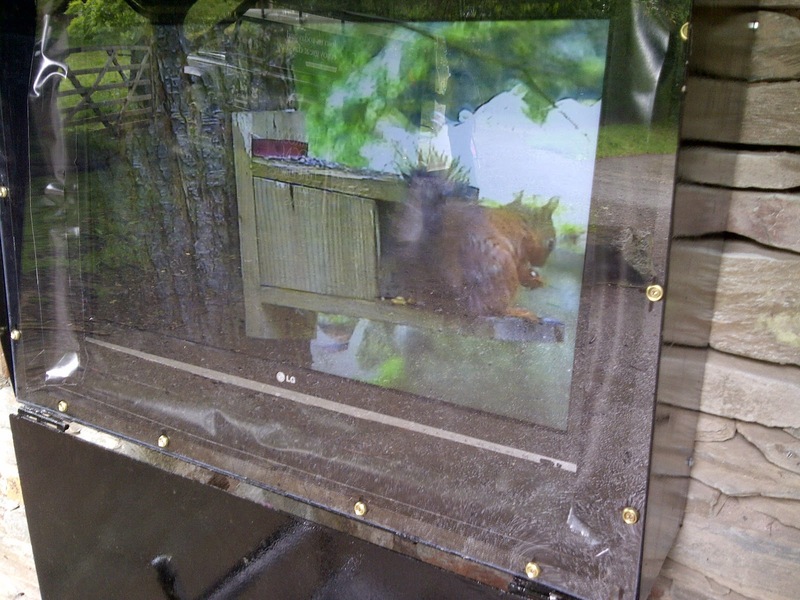 This image is of a red squirrel making full use of one of the feeders... (caught on one of the strategically placed cameras and relayed back to a monitor in the Visitors' Shelter). See post...Aira Force Red Squirrel Trail. Overall the new "visual identity" has been a success. Most people like the bold colours and the minimalist imaging on the vehicles. The stone built roadside walls of the Lake District are regularly damaged by vehicles. Time is set aside for the Central and East Lakes Rangers to repair damaged National Trust roadside walls, usually in Autumn or Winter. A car recently hit the roadside wall at Millerground. This masonry wall (stone cemented together with mortar) required a lot of preparation work before rebuilding work could begin. On impact the wall broke up into large irregular shaped blocks. Time consuming work was put into separating the stone from the mortar. In the image above a wrecking bar was used to prise the top or cam stones apart. Dry stone walls usually require a lot less preparation work because no mortar is used in their construction. In addition, no sand, cement or a mixer is needed! With the top stones removed, a sledge hammer was used to separate the walling stone from the tenacious grip of the mortar! Because of the height difference between the two sides of this retaining wall, scaffolding was needed. The stone and chunks of mortar were cleared back from the damaged wall to allow access for the scaffolders. The damaged section of the wall has been taken back to where the wall is sound and is now ready to be rebuilt. The scaffold is in place with the planks cleverly arranged around the big beech tree. The wall is being rebuilt using mortar as it was originally. The last of the mortar is being removed from the stones using walling hammers and cold chisels. The lumps of old mortar did not go to waste. They came in useful as filler for the ongoing revetment work at Millerground! With the wall now up to height the top stones can be put into position. The completed work. Hopefully, for everyone's sake, it will not be hit again...at least not for a long time!